ST. GEORGE – Thomas S. Monson, president of The Church of Jesus Christ of Latter-day Saints, was released from a hospital in Salt Lake City Wednesday evening, according to church officials. “President Monson was released from the hospital last evening, and plans to resume his normal schedule and duties today,” church spokesman Eric Hawkins said in an email to media Thursday morning. The 89-year-old president of LDS church entered the hospital Monday evening and was receiving “treatment and fluids,” Hawkins said, adding that the hospital stay was anticipated to be a short one. 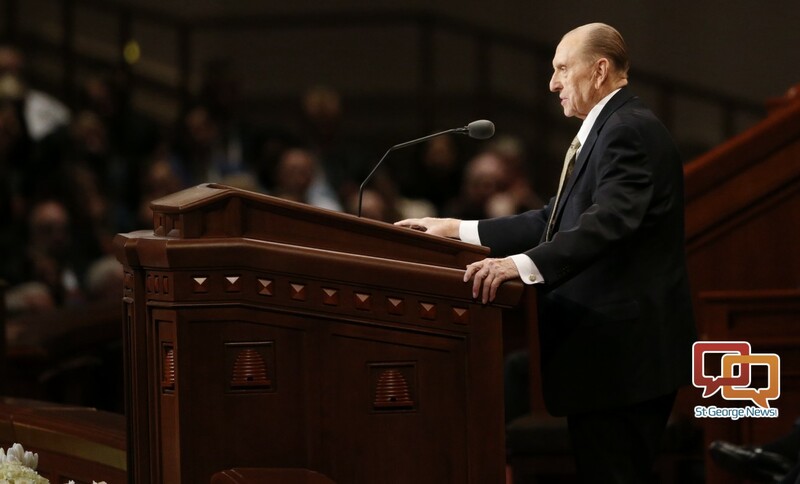 For a short time Wednesday afternoon rumors circulated on social media that Monson had died. Those rumors were quickly debunked. Monson’s hospital visit came in the wake of the church’s semiannual general conference. During the two-day general conference, Monson made short appearances at the pulpit. He was also absent during much of the conference in order to conserve energy. Members of the LDS church view Monson as a prophet – one granted authority by God to speak in his name. During the recent general conference, Monson encouraged church members to live the principles of “kindness, charity and love,” along with urging them the read The Book of Mormon each day. Monson also announced the locations of five new LDS temples, including one in Saratoga Springs. Monson became the 16th president-prophet of the 15-million member LDS church on Feb. 3, 2008, following the death of then President Gordon B. Hinckley.